To Nordvangen on the "Ships starting with N" page. Built by International Shipbuilding & Engineering Co. Ltd., Danzig in 1929. As will be seen when going to Page 1 above, Nordvangen was in New Orleans when war broke out in Norway on Apr. 9-1940. Left Paramaribo on Febr. 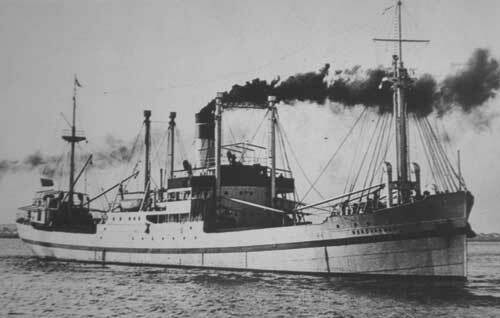 18-1942 with a cargo of bauxite for New Orleans via Trinidad, and was expected at Trinidad on the 21st. On March 6 it was reported that parts of a lifeboat marked Nordvangen and deck house scantlings from the ship had been washed ashore in Trinidad. She had been torpedoed and sunk by U-129 (Clausen) on Febr.20, 10 50N 60 54W. Rohwer adds that wreckage from Nordvangen was found in this position. For info, this U-boat was also responsible for the attacks on L. A. Christensen, Cadmus, Gundersen, Port Antonio, Trafalgar and Astrell - follow the links for details. Back to Nordvangen on the "Ships starting with N" page.